WASHINGTON (NNPA) – “Well, who are they coming to get now?” That’s what Norman Murray thought as police officers ran in his direction with guns drawn. Murray, a native Washingtonian with a slim build and matted dreadlocks, looked around to see who the cops were chasing through his neighborhood in the Trinidad section of Northeast Washington, D.C.
Murray, who was neither using nor selling marijuana, couldn’t believe what was happening. Before he could make sense of the senseless, another officer snatched the can of ice tea Murray was drinking out of his hand and sniffed it for the scent of alcohol. When there was no hint of alcohol, he tossed the can to the pavement, spilling tea on the sidewalk. Unsatisfied, the officers continued to rifle through his pockets. They found his house keys and tossed them aside, too. They found a cell phone, a bag of M&Ms and $1,000 he had to purchase a money order to pay that month’s rent. No drugs. No alcohol. No reason to take him to jail. Murray watched helplessly as one of the officers stuffed his rent money into his pocket. Murray said they kept his cell phone for a month. It took eight months to get his rent money back, and when he did, Murray said, $250 was missing. “It’s not like they don’t know who sells drugs,” Murray said, recalling the shocking events that took place a little over a year ago. It’s an all too familiar scene played out on the corners of our nation’s most impoverished neighborhoods: Black men targeted by law enforcement without cause. In his 2010 book The Presumption of Guilt: The Arrest of Henry Louis Gates, Jr. and Race, Class, and Crime in America, Harvard Law School professor Charles Ogletree found that racial profiling cuts across class and racial divides. Ogletree recounted stories that many prominent Africa-American leaders shared with him about their experiences. “The examples of it affecting people that were doctors, teachers, lawyers, entrepreneurs, clergy and other professions was a profound reminder that it’s very widespread and deeply affects our community,” Ogletree said. Professor Ogletree’s book highlights example after example of Africa-American men who were not engaged in any type of criminal activity yet were still profiled by police. 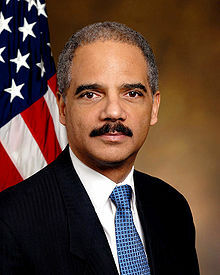 Even Eric Holder, now U.S. attorney general, wasn’t able to avoid a plight experienced every day by Black men in America. Holder shared an experience he had in the 1980s as an undergrad at Columbia University in New York. As he traveled home to Washington, D.C., he was pulled over by police. Even though they told him he had done nothing wrong, they still wanted to search his car for drugs. A 2008 study conducted by the Bureau of Justice Statistics illustrated the perils of DWB – Driving While Black. Although Blacks, Whites, and Hispanics were stopped by police at similar rates, Blacks were three times (12.3 percent) as likely as Whites (3.9 percent) and twice as likely as Latinos (5.8) to be searched during a traffic stop. Blacks were also more likely to “experience the use or threat of force” than other groups. Other studies have shown that stopping more Blacks doesn’t stop more crime. “The data on racial profiling is unequivocal and it comes from all across the country,” said David Harris, a professor of law at the University of Pittsburgh and an expert on racial profiling. “When police use race, or ethnic appearance, or religious appearance in this way, they do not become more accurate. In fact they don’t even stay as accurate, they become less accurate than police officers and security agents who do not use these practices,” Harris said. More police need to be asking, what makes a person suspicious, said Ronald Davis, Chief of Police for the City of Palo Alto, Calif.
Laura Murphy, director of the Washington, D.C. legislative office for the American Civil Liberties Union (ACLU), said the problem extends the Black community to other groups such as Latinos, Muslims and Asians.